There are few books that have caused as much controversy as the Holy Bible. For centuries now, it has been regarded by many to be the "one true word of God". The writers of the Bible may have been human beings... but it is said that those writers had "divine inspiration" for their words. The birth of the Christ child, or Jesus, that comes to save mankind from damnation is told in both Matthew and Luke in the New Testament. It describes a child, born in the stables of an inn to a virgin... a child that would shed his blood for all of those who would otherwise be forever separated from God. However, religions and worship of deities existed before the writings of the Bible. Ancient Greek, Roman, and Egyptian gods and goddesses and their worship have been evidenced in tombs that have been recovered that predate these writings, along with recovered passages of the Egyptian Book of the Dead. One Egyptian god is especially interesting in comparison to the life of Jesus... a god known as Horus. One important note about the gods and goddesses of ancient Egypt... they were not one-dimensional beings. Their many facets gave them multiple duties and aspects of worship at different points in time. What is notable about Horus in relation to the connection to Jesus is that in one of his facets he is called Shed... or "savior". Another point of interest is the birth of Horus. While there are many accounts of it, one of the most widely known is that he was born of the goddess Isis and the god Osiris... and according to some it was a divine conception. There are differing accounts of this... some of which have Isis as the wife of Horus, rather than his mother, which is a bit confusing. However, looking further it is seen that often in these mythologies, the deities would merge together as one. Isis is often identified with the goddess Hathor... who is also credited with being the mother of Horus. Most accounts have Isis as his mother, and it is the one used in the arguments supporting the Bible being inspired by stories of the past. Horus is also the only son of the Osiris, the god of fertility and vegetation. His birth was recorded in the Egyptian Book of the Dead centuries before the birth of Jesus and the first writings of the Bible... and a lot of the similarities are difficult to ignore. In the Egyptian creation story, the four children of Geb (god of the sky) and Nut (goddess of the earth) sired four children. These were, respectively, Osiris, Isis, Set, and Nephthys. 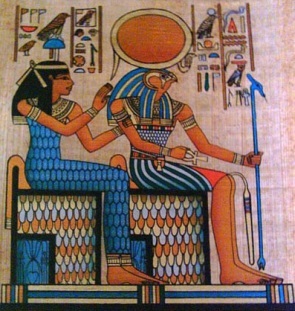 Osiris ruled Egypt with his sister Isis, who he married. His brother, Set, was extremely envious of the position Osiris held... so much so that he used the powers he had to change himself into a beast that tore Osiris from limb to limb. He then had all the pieces distributed throughout the land. Isis was heartbroken, and stepped back as Set and their sister Nephthys became rulers of Egypt. Nephthys felt badly for Isis, and helped her travel to find the many parts of Osiris. Whether or not she found them all is unknown... however, according to legend, she was able to conceive a child, Horus, with him. Osiris then became god of the underworld. Since it is thought the act was done without everything available to do so, the argument has been that Horus was a divine conception. All of that aside... in looking at the paths of Horus and Jesus in their times on earth, there are these things to consider. Isis was told of her pregnancy by a divine spirit. When Isis gave birth to Horus, she did so in a cavern, surrounded by many animals. The three deities of the Sun were informed of the birth by the star known as Sirius... or the eastern morning star... and arrived to pay their respects to him (by most accounts, they were not present at the birth, but rather a few years later). The time of his birth was around the winter solstice, or between the 21st and 26th of December. When Set heard of the birth of the child, and knowing who the child belonged to, he immediately ordered the child be killed. There was a warning given to Isis by the gods to get herself and Horus out of Egypt. Horus is said to have been revealed his purpose at the age of 12... and a significant amount of time about him is unknown until the age of thirty. He kept a select number of people very close to him, and was subject to temptation for a period of time from Set, who led him to a mountaintop and offered him equal ruling in Egypt if he would stand behind him... which Horus refused. After this time, he was said to teach a message of brotherhood and compassion for fellow man, and was highly respected by the people... and feared by those who wanted the power for themselves. It is also said that he was put to death... although being a god, he was immortal. The method of killing Horus has been debated from being nailed to a tree to being attacked by scorpions. Either way he was sentenced by his own people, the very ones he was there to save. It is said that he then went on to rule at his father Osiris's side. Set, the uncle of Horus, was his adversary, much as Satan was the adversary of Jesus, son of God. It was said that when Horus was killed and resurrected, he would return and rule for a millennium... or one thousand years. Some of this is sounding very, very familiar... however it is not to say that there aren't very significant differences. The mother of Jesus was a human being that God found favor with, whereas Isis was a goddess who conceived a child in essence with her own brother. Jesus has always appeared as fully human, whereas Horus has been portrayed as half man half bird. The role of Horus as "savior" is often shown as being a protector, whereas Jesus to those of the Christian faith, came to save mankind through his death. In looking at the arguments presented in favor of Horus being the inspiration for the stories of Jesus in the Bible, one must of course recognize that the purpose is to show fallacy in the Scriptures. Those arguing against the similarities of course do not want to admit that the book of their faith could in any way be wrong. It simply couldn't have been inspired by anything other than God Himself. The similarities in the stories of Horus and Jesus however show that at the very least, the story of a savior to aid mankind had been told before. The question remains... was the Bible truly written through divine inspiration, or was it merely a careful retelling of an ancient religion... one of the many that the Bible said to avoid?